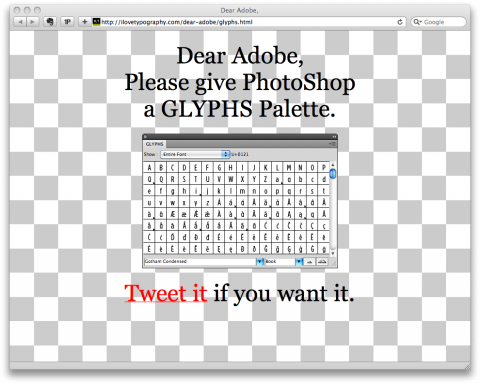 Dear Adobe, Please give PhotoShop a GLYPHS Palette. This is Adobe’s way to saying “you shouldn’t be doing anything type-heavy in Photoshop.” I have the feeling anyone this passionate is also making massively complicated web interfaces in Photoshop — which is clearly not the best tool for that job either. Get to know Illustrator, or better yet, InDesign. Photoshop is designed to create and manipulate images, not text. Also, “Photoshop” is a trademarked name, and therefore should be spelled with only one capital letter — the P. Ironic, coming from such an apparent type-hawk. Well if you need it that badly you can also use the glyphs palette of your operating system. Yes PS should not be used for too typographic projects, but there are some exceptions where it makes sense to use it. Still it would be nice to have glyphs integrated in PS as you would not have to open the OS palette all the time. In one way you are correct. Type heavy documents should be done in another programme. However don’t be too narrow-minded about this, I’ve been in need of the glyphs panel in Photoshop for years. In particular, when working with Icon fonts (i.e. images not text) with no recognisable key assignment. It’s just tiresome to have to open indesign/illustrator os-keyboard just to find out where the right icon is. So yes Adobe – please make glyphs possible in PS. And more importantly, please iron out all the inconsistencies in your CS interfaces. As long as it doesn’t further bloat the application, I’m all for it. But I’d still rather have people use the right tool for the job. @Prescott: it doesn’t bloat the application. The keyboard palette is part of OS X and available in any program. Just turn it on in the keyboard settings and you’ll find it in your menu bar. OS X also has standard UI elements in order to select fonts and colours. All those palettes allow you to save favorites and browse and search for glyphs/fonts/colours. Maybe I’m missing something important here; but on Mac OS I just open the Character Viewer from the Input Menu. And it’s far better designed than any other glyphs pallette I’ve used. I thought this was a good inside joke for a minute … until I realized it wasn’t. I think I’ll just design everything in MS Word from now on. It handles pictures right? as many people have already said you shouldn’t be using text in photoshop!!! its for photos!!! is someone reading my mind there?